For now, though, I recommend that income-seekers go a different route and pick stocks (and closed-end funds [CEFs]) that benefit from cheaper oil and gas—like utilities. The reason is simple: these companies will pay less to fuel their plants, driving up their profit margins—and their dividend payouts, too. So what’s the best way to buy in? 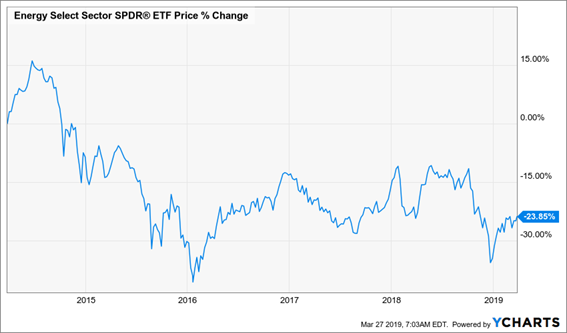 You could choose a utility ETF, like the Utilities Sector SPDR Fund (XLU). With a 3% yield, it pays 70% more than an index fund like the SPDR S&P 500 ETF (SPY). But my favorite method probably won’t surprise you: CEFs! The Cohen & Steers Infrastructure Fund (UTF), for example, pays a 7.6% dividend now, while trading at a 4.6% discount to net asset value (NAV, or what it’s underlying portfolio is worth). It also holds major electric utilities like NextEra Energy (NEE) and Atmos Energy (ATO). Now let’s dive into some of the other issues that are bound to keep energy down for a long time to come. We hear a lot about alternative fuels these days, but if you’re reading this, you’re still likely using more power generated by oil, coal and nuclear power than wind and solar. 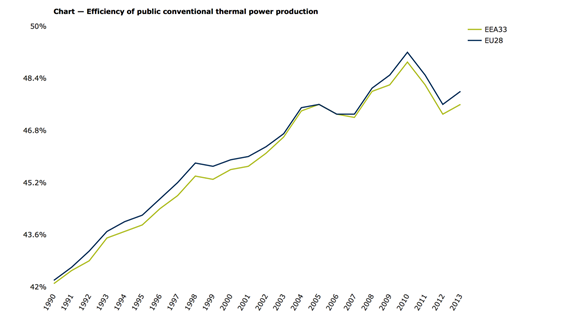 The real story is a bit more boring: people are simply using less energy—and utilities are learning to provide more power with less energy inputs, raising their profit margins. The same trend holds in the US, where from 1980 to 2014, the fuel economy of vehicles fell by over 25%, industrial energy efficiency rose 40%, and lost energy from transport fell by 25%, according to the American Council for an Energy Efficient Economy. And if you’re looking for China for growth, think again. It’s getting better at using energy, too. Note the one line going down? 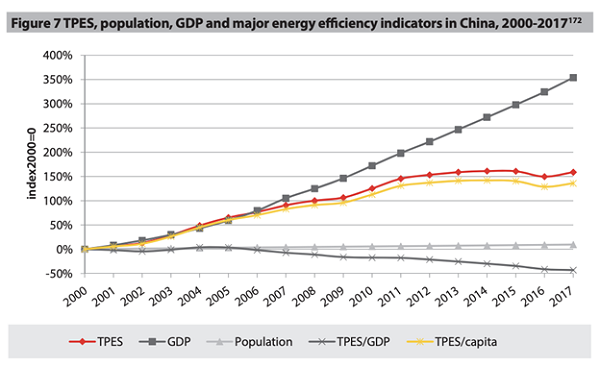 That’s the ratio of total produced energy to GDP, indicating that China has been more efficient in its use of energy (the IEC estimates energy production to GDP fell by over 3% in 2018, continuing the trend). Another problem for oil bulls: population growth is slowing. 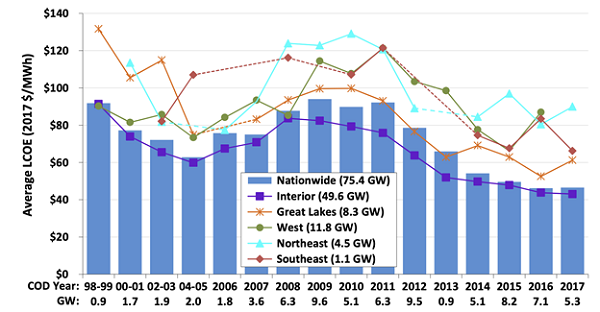 With slower population growth, the natural growth of energy demand will slow, as well. 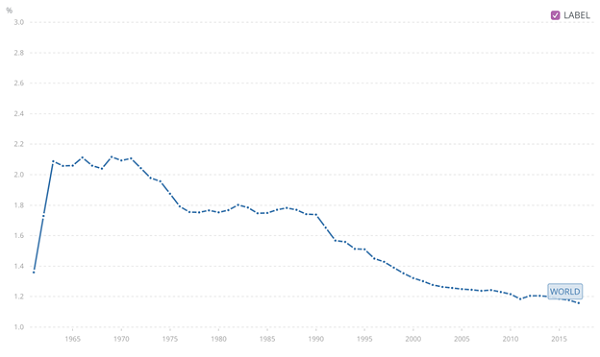 Meantime, alternative-energy costs are tanking, making it easier to replace oil with other fuels. While alternatives still face a few hurdles (the largest of which is storage), it’s clear that lower costs for alternative fuels will mean companies and consumers will choose them more often, creating another headwind for oil. While oil companies can pivot to alternative energies (Royal Dutch Shell [RDS] has been particularly good on this front), the transition is slow and full of risks that constantly need to be repriced in. RDS said it will likely spend between $1 billion and $2 billion on alternative energy per year in 2019, which is just 4.3% of the company’s operating expenses in 2018 and 0.4% of its annual revenues. But RDS’s sales still depend on oil prices, and little has changed in the last five years; the company’s 2018 revenues were still down 7.8% since 2014. The bottom line? These companies are clearly not set for a future of steadily declining oil demand, and we need to invest for the future, not the past. The risks of betting on oil firms turning around are simply too high. Right now I’m pounding the table on no less than 15 funds throwing off some of the juiciest yields on the market (including one “unicorn” paying an outsized 9.9% payout!). And before you ask, no, not a single one is an energy fund. And yes, you do get plenty of exposure to utilities—the stocks in the very best position to cash in on oil’s weakness. Better yet, these 15 cash machines are primed for double-digit gains in the coming 12 months! And I’ll give you the names of all 15 when you take a no-risk trial to my CEF Insider service today. Right now, the portfolio boasts an average yield of 7.5%. But that’s just the average! 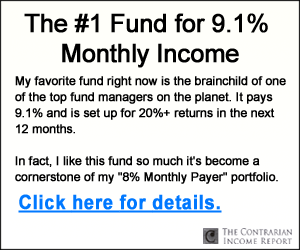 Cherry-pick my 3 highest-yielding CEF buys and you’ll pocket life-changing payouts like 8.5%, 9.8% and 9.9%! I hope you’ll take this no-risk opportunity to join the small group of investors pocketing regular dividend checks—every month—from these terrific funds. This exclusive guide reveals the names, tickers, buy-under prices and more on 4 of my favorite CEFs for 2019. Grab these 4 cash machines now and you’ll trigger a huge income stream and position yourself for fast 20%+ upside, too! Don’t wait. 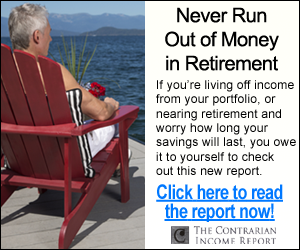 CLICK HERE now to get your copy of this revealing FREE report and start your no-risk trial to CEF Insider now.